Your PC could be slowed down by programs you haven’t used in ages or never wanted in the first place — trial versions, unwanted toolbars, or preinstalled software. These are a waste of space and speed, and may even be a security risk. Our new Software Cleanup feature gets rid of them once and for all. 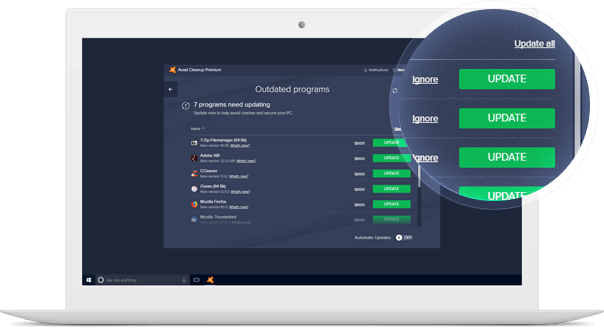 Take the guesswork out of figuring out which programs you no longer need with our cloud-based reputation and unneeded-program detection systems. If you’re afraid to uninstall, we can temporarily put files in quarantine until you decide. Your PC accumulates a ton of wasteful data every day. But we’ve got your back. Our Automatic Maintenance regularly removes these junk files for you. Automagically. Outdated programs can leave your PC vulnerable to bugs, crashes, and security risks. Our new Automatic Software Updater regularly updates your most critical programs for you. Software updates can be critical to keeping your PC running smoothly and safely. Here’s why you shouldn’t ignore them. According to our data, over 55% of all installed applications worldwide are outdated, leading to potentially critical security issues. Our Software Updater helps patch security holes for you silently, saving you the hassle of finding, downloading, and installing the updates yourself. Bug fixes are part of many updates, so Software Updater helps you enjoy your software with fewer annoying crashes and error messages. We support the most popular applications on earth, such as Adobe Reader, Skype, VLC Player, and WinRAR. New updates often bring new features. For example, VLC Player 3 added support for up to 8K and HDR video — something you’d miss if you never updated. Software Updater installs the updates for you automatically, so the next time you open your favorite app, any new features will be ready to go. Regularly cleans and tunes your PC for you — without you lifting a finger. Finds and installs the latest updates for your most important apps - automatically. Score in points based on PCMark score, showing multitasking and multimedia abilities. The higher the score, the better. 71 GB of space freed up after removing temporary files using Avast Cleanup’s Disk Cleaner.